Plunder case against Governor Raul Lee et al. O. RAVANILLA, ANGEL E. ESCANDOR, BENITO L. DOMA, BERNARD H. HAO, PATRICK Q. RODRIGUEZA, NESON A. MARAÑA, all incumbent Members of the Sangguniang Panlalawigan of Sorsogon. 2.4 Even granting without admitting that Annex “5” of the Joint Counter-Affidavit of Messrs. Manzanades and Eje was submitted, the allegations in paragraph 4.5 that all charges shall be waived according to Annex “4” are NOT CORRECT. Review of Annexes “4” of the Joint Counter-Affidavit reveal the truth. “Section 4. Interest: Prevailing prime rate at the time of availment plus 1% min. spread, provided a minimum of 3% Account Profitability Rate (APR) is met. Subject to quarterly repricing or at applicable special financing rate if special funds is accessed. “Section 4. Interest Rate/s. Interest of the LOAN shall be equivalent to LENDER’S prevailing prime rate at the time of availment at applicable special financing rates, if funded under special financing program. Gross Receipt Tax (GRT) shall be for account of the BORROWER. 2.7 Respondent Manzanes offer of 5.061% has become an illusion. It is no longer found in any of the two LBP Loan Agreements (marked in the Annexes “14” and “15” of the Joint Counter-Affidavit of Messrs. Manzanades and Eje) both signed by Respondent Governor Lee and Respondent LBP Vice President Renato G. Eje. “Government financial and other lending institutions are authorized to grant Local Government Units such loans, credit lines, advances, and other forms of indebtedness for projects and purposes referred in paragraph (B) hereof, preferably at concessional interest rates lower than the prevailing rates as may be authorized by the governing board of the financial or lending institution. (g) Entering, on behalf of the Government, into any contract or transaction manifestly and grossly disadvantageous to the same, whether or not the public officer profited or will profit thereby. 4. Indeed, with the admission of the truth that the PNB proposal of five percent (5%) is most advantageous than 5.061% of LBP but was never acted upon by the Provincial Government and by the Respondents, the evidence of guilt of respondents are strong enough to warrant immediate preventive suspension from the office. 5. The undersigned would like to respectfully reiterate that in a Letter dated July 5, 2012 (marked as Annex “N” in my Complaint) of Dominador O. Jardin, Prov’l. Gov’t. Dept. Head of the Provincial Planning and Development Office (PPDO), addressed to the undersigned complainant, he stated that his Office could NOT come upon any feasibility study of the list of projects such as roads, bridges, buildings, farm to market roads and tourism facilities funded in the P350,000,000.00 LBP loan from available existing records. These only shows that the PPDO officer nor his office was made a part of the official action of the provincial government to come up with the decision to justify and substantiate the loan application for some “priority projects“ of respondents. 6. Worst, based on the Letter dated June 1, 2012 (marked as Annex “V” in my Complaint) of Provincial Treasurer Efilda C. Nogales and Provincial Accountant Mercedes J. Ativo duly noted by Respondent Gov. Lee, the Provincial Government had ALREADY PAID an amount of SEVENTY TWO MILLION NINE HUNDRED TWENTY FIVE THOUSAND NINE HUNDRED FORTY EIGHT PESOS AND SIXTY ONE CENTAVOS (P72,925, 948.61) to various contractors. In sum, the THREE HUNDRED FIFTY MILLION PESOS (P350,000,000.00) LBP Loan resulted in grave irreparable damage and prejudice to the Sorsogon taxpayers. Section 2. Definition of the Crime of Plunder; Penalties – Any public officer who, by himself or in connivance with members of his family, relatives by affinity or consanguinity, business associates, subordinates or other persons, amasses, accumulates or acquires ill-gotten wealth through a combination or series of overt criminal acts as described in Section 1 (d) hereof in the aggregate amount or total value of at least Fifty million pesos (P50,000,000.00) shall be guilty of the crime of plunder and shall be punished by reclusion perpetua to death. Any person who participated with the said public officer in the commission of an offense contributing to the crime of plunder shall likewise be punished for such offense. In the imposition of penalties, the degree of participation and the attendance of mitigating and extenuating circumstances, as provided by the Revised Penal Code, shall be considered by the court. The court shall declare any and all ill-gotten wealth and their interests and other incomes and assets including the properties and shares of stocks derived from the deposit or investment thereof forfeited in favor of the State. IN WITNESS WHEREOF, I have hereunto affixed my signature this 12th day of February 2013 at Quezon City, Philippines. SUBSCRIBED AND SWORN to before me this 12th day of February 2013 at Quezon City, Philippines. Affiant exhibited to me his Driver’s License bearing number 3-90-102197 containing his picture and signature as competent evidence of his person. 14. RENATO G. EJE, Vice President, Land Bank of the Philippines, Head Office. all incumbent Board Members of the Sangguniang Panlalawigan of Sorsogon. 1. On January 17, 2011 Sangguniang Panlalawigan of the Province of Sorsogon passed Resolution No. 5-2011 entitled “Resolution Granting Authority to Governor Raul R. Lee to Enter into a Loan Agreement with any reputable Banking Institution offering a more favorable deal to the Provincial Government relative to the P350 million Bank Loan of the Province of Sorsogon.” A photocopy of said resolution is hereto attached as Annex “A”. a.Legislative actions of a general and permanent character shall be enacted in the form of ordinances, while those which are of temporary character shall be passed in the form of resolutions. Matters relating to proprietary functions and to private concerns shall also be acted upon by resolution. b.Proposed ordinances and resolutions shall be in writing and shall contain an assigned number, a title or caption, an enacting or ordaining clause, and the date of its proposed effectivity. In addition, every proposed ordinance shall be accompanied by a brief explanatory note containing the justification for its approval. It shall be signed by the author or authors and submitted to the secretary to the sanggunian who shall report the same to the sanggunian at its next meeting. c.A resolution shall be enacted in the same manner prescribed for an ordinance, except that it need not go through a third reading for its final consideration unless decided otherwise by a majority of all the sanggunian members. d.No ordinance or resolution shall be considered on second reading in any regular meeting unless it has been reported out by the proper committee to which it was referred or certified as urgent by the local chief executive. e.Any legislative matter duly certified by the local chief executive as urgent, whether or not it is included in the calendar of business, may be presented and considered by the body at the same meeting without need of suspending the rules. f.The secretary to the sanggunian of the province, city or municipality shall prepare copies of the proposed ordinance or resolution in the form it was passed on second reading, and shall distribute to each sanggunian member a copy thereof, except that a measure certified by the local chief executive concerned as urgent may be submitted for final voting immediately after debate or amendment during the second reading. g.No ordinance or resolution passed by the sanggunian in a regular or special session duly called for the purpose shall be valid unless approved by a majority of the members present, there being a quorum. Any ordinance or resolution authorizing or directing the payment of money or creating liability, shall require the affirmative vote of a majority of all the sanggunian members for its passage. h.Upon the passage of all ordinances and resolutions directing the payment of money or creating liability, and at the request of any member, of any resolution or motion, the sanggunian shall record the ayes and nays. Each approved ordinance or resolution shall be stamped with the seal of the sanggunian and recorded in a book kept for the purpose. None of these Rules were observed by the respondents Vice-Governor and the respondent Sangguniang Panlalawigan Board Members concerned. 2. On March 1, 2011, a letter was sent by a certain Alfonso C. Tanseco and Edlyn G. Quesada, Senior Vice-President and Account Officer, respectively, of the Philippine National Bank (PNB for brevity) to respondent Governor Raul R. Lee containing indicative terms and conditions for the possible financing of various projects of the Provincial Government of Sorsogon. It shows that if PNB is chosen, the principal loan of THREE HUNDRED FIFTY MILLION PESOS (P350,000,000.00) shall bear an interest rate of 5.38%. A photocopy of the letter is hereto attached as Annex “B” and the interest rate thereon as Annex “B-1″ and are made integral parts hereof. 3. On March 7, 2011, respondent Hil Benedict G. Manzanades, Department Manager and Head of Land Bank of the Philippines (LBP for brevity) in Legazpi City, submitted a similar proposal to respondent Governor Lee also to extend a loan for the various projects of the Provincial Government of Sorsogon at the rate of 7.0%. A photocopy of the letter is hereto attached as Annex “C” and the interest rate thereon as Annex “C-1”. 4. On March 25, 2011 respondent Governor Lee wrote a letter to respondent Vice Gov. Antonio H. Escudero as the Presiding Officer of the Sangguniang Panlalawigan regarding the convening of the “Finance Committee” to finalize their recommendation on the proposals of PNB and LBP. In said letter, Respondent Governor Lee was clearly instructing the Sangguniang Panlalawigan for the passage of a Resolution to authorize the latter to enter into a loan agreement with PNB. Question is, what will now be the effect of the recommendation of the Finance Committee if the governor has already chosen a favored Financial Institution then, in this case the PNB. A photocopy of the said letter is hereto attached as Annex “D”. 5. On March 30, 2011 respondent Hil Benedict G. Manzanadez, Dept. Manager/Head, LBP Legazpi City wrote another letter to Governor Lee. This time, LBP was offering the prevailing interest rate of 5.061%. A copy of said letter is hereto attached as Annex “E” and the new interest rate as Annex “E-1”. 6. Undersigned Complainant has been very consistently inquisitive as to the practice of irregularities and short cuts of procedures by the provincial government in securing loans because the respondents could not even account, liquidate nor properly come up with a report for previous loans and justify not only to the complainant but to the general public if the loans were for the their best interest and has the most reasonable terms for the Provincial Government. The Complainant in his own capacity and as a duly elected government official has been very vigil in inquiring the possible negative implications it has on the Provincial Government in securing loan in the form of letters, privilege speeches, inquiries in aid of legislation, as they remain the liabilities of the LGUs even after the term of the contracting officials has ended. Based on an on-going congressional inquiry on House Resolution 1196 of this 15th Congress of the House of Representatives, there has been a reported increase in most LGU bad loans. Such as in the case of the previous administration’s provincial loan of P260.0 million with LBP which has yet to be liquidated, reported and still remains existing and if proper safe guards are not in place this may happen again. Please find the hereto attached communications to respondent Hil Benedict Manzanades, Department Head of LBP Legazpi City and to LBP President Gilda E. Pico are hereto attached as Annexes “F”, “G”, “H” and “I”. 7. On May 12, 2011 both Alfonso C. Tanseco, Senior Vice President and Julius Ceazar P. Banog, Account Officer of the Philippine National Bank, sent another letter to respondent Gov. Lee and also offered a new interest rate, this time it’s 5%. A photocopy of the letter is hereto attached as Annex “J” and the new interest rate as Annex “J-1”. 8. A perusal of the proposals of the two financial institutions offering loan options, it shows that PNB offered the lowest interest rate, which is FIVE PERCENT (5%). 9. Thereafter, without offering any explanation, justification nor an evaluation by a government or provincial body, not even the so-called “Finance Committee” nor a Sangguniang Panlalawigan Committee, respondent Governor Lee whimsically and on his own caprice set aside the PNB proposal and instead favored the proposal of the LBP. This can be shown by the letter dated May 17, 2011 Governor Lee to Vice Governor Escudero in his capacity as the Presiding Officer of the Sangguniang Panlalawigan and submitted a copy of the proposed Loan Agreement from PNB for the Sangguniang Panlalawigan’s perusal, review and ratification. The respondent Governor did not consider the proposal from the other financial or banking institution, at least, to make sure that the contract which is most advantageous to the Provincial Government could be had. A photocopy of the letter is hereto attached as Annexes “K” and the PNB loan agreement as Annex “L”. It is noteworthy that there was neither a single official committee hearing held nor any public consultation done for this purpose. This is a glaring show of conspiracy between the Governor on one hand and the Vice Governor and the concerned Board Members, because despite this the Sangguniang Panlalawigan expeditiously passed and approved Resolution No. 92-2011 LBP which has a higher interest rate of 5.061% (Please find hereto attached Photocopy of the Resolution as Annex “M”. Again, in direct Violation of Article 7 of the Implementing Rules and Regulations of the Local Government Code earlier cited. 11. Further, the respondents Governor and Vice Governor as well as the aforementioned Board Members of the Sangguniang Panlalawigan did not even exert efforts nor initiate any actions necessary to secure concessional interest rates or such interest rates lower than the prevailing interest rate to justify their actions as if treating the provincial funds and decisions as their own personal funds. 12. The irregularities may be easily inferred from the sequence of events prior to the signing of the aforesaid Memorandum of Agreement (MOA) with the Land Bank of the Philippines. There was no evaluation nor any recommendation from any government or provincial body or even the “Finance Committee,” to show that the list of projects is included in the Annual Investment Plan of the province for the loan. How can a handful elected officials now decide on their own which projects or endeavors are most beneficial to the province and the poor people of Sorsogon. In a letter dated July 5, 2012 by Dominador O. Jardin, Prov’l. Gov’t. Dept. Head of the Provincial Planning and Development Office (PPDO for brevity) to the complainant, he said that his Office could NOT come upon any feasibility study of the list of projects such as roads, bridges, buildings, farm to market roads and tourism facilities funded in the P350,000,000.00 LBP loan from available existing records. A copy of this letter is hereto attached as Annex “N” to show that not even the PPDO officer, was included nor was his office made a part of the official action of the provincial government to come up with the decision to justify and substantiate the loan application for some “priority projects “of the respondent Governor, respondent Vice Governor and respondent SP Members concerned. What is now the legal or even economic basis if any of such loan? (c) Exercise such other powers and perform such other functions and duties as may be prescribed by law or ordinance. And despite the absence of any or all legal requirements to support their reason for applying for a loan for a list of projects which is not even included in the Annual Investment Plan, accused Governor Lee wrote a Letter on October 5, 2011 to the Honorable Members of the Sangguniang Panlalawigan requiring the Presiding Officer and Vice Governor Escudero, the Chairs and Members of the Committee on Budget and Appropriations and the Committee on Public Works, Infrastructure and Highways to be present during the signing of the Memorandum of Agreement on October 19, 2011, 9:00 a.m. at the LBP Legazpi City Office. (A photocopy of said letter is hereto attached as Annex “O”. 1. Request of the Governor endorsing to this Honorable Body for review, the Land Bank of the Philippines’ evaluation of the proposed P350 million loan of the Province of Sorsogon. 2. A draft Memorandum of Agreement between Land Bank of the Philippines and the Province of Sorsogon. A photocopy of the Certification is hereto attached as Annex “P”. This clearly shows that the SP did not even have the privilege to scrutinize any loan agreement or proposal of the financial entity, and despite this the respondents passed and approved the accused governor’s for a resolution to enter into a loan. The reason or consideration for said approval to allow the governor to enter into said agreement is now the biggest question. 14. Significantly, it is worth mentioning that the abovementioned Letter was dated October 5, 2011; while in a Letter of respondent Hil Benedict G. Manzanadez, Dept. Manager and Head LBP Legazpi City Office dated October 17, 2011, it was only there that Manzanadez notified respondent Governor Lee about the LBP approval of the whooping P350.0 million loan. The said Letter was received by the Office of the Governor only on October 18, 2011. Please find the letter hereto attached as Annex “Q”. A simple layman would not think that the approval of this controversial loan was pre-arranged by respondents Governor Lee with Vice Governor Escudero including members of the Sangguniang Panlalawigan as cohorts. The conspiracy appears to extend to the officers of the LBP who suddenly wrestled out the loan from PNB and kept the same unknown to other banking or financial institutions. Respondent knowing fully that PNB has the lowest interest rate. The records shows that the respondent Governor, as early as October 5, 2011, already knew of the approval and the date, time and venue of the schedule for the signing of the LBP Loan Agreement way ahead of time. Another major question now is that how come the loan was split into two loan agreements with different Interest Rates and Terms by the LBP with-out any prior notice or approval from the Sangguniang Panlalawigan, considering that the authority of the governor was specifically for the whole amount of P350.0 Million and not for the aggregate amount of P100.0 million and another P250.0 Million. 15. Noteworthy to mention is that respondents Governor Lee, Vice-Governor Escudero and the concerned Board Members of the Sangguniang Panlalawigan particularly singled- out LBP despite the higher interest rate it offered compared to the PNB proposal as the only financial institution to service the loan being secured by the Provincial Government without even asking for any justification nor explanation from Governor Lee for choosing the LBP over the PNB offer. 16. The respondents Presiding Officer and the concerned Board Members of the Sangguniang Panlalawigan did not even bother to inquire as to the glaring conspiracy between respondent Governor Lee on one hand, and some officials of LBP for the purpose of securing a loan to the detriment and disadvantage of the Provincial Government. Where LBP offered 5.061% compared to the PNB’s lower interest rate of 5%. In fact, on October 21, 2011, respondents ratified, confirmed and approved Resolution No. 152-2011 entitled “Resolution ratifying, confirming and approving the Loan Agreement by and between the Land Bank of the Philippines and the Provincial Government of Sorsogon represented by Provincial Governor Raul R. Lee governing a loan in the amount of One Hundred Million Pesos (P100,000,000.00). A photocopy of the Resolution No. 152-2011 is hereto attached as Annex ”T”. The respondents Presiding Officer and the Sangguniang Panlalawigan Board Members concerned, violated AGAIN a cardinal rule in the passage of Resolutions and Ordinance as provided for in the Article 7 of Implementing Rules and Regulations of the Local Government Code earlier cited. 17. On May 21, 2012, respondents Vice Governor Escudero and the mentioned Board Members of the Sangguniang Panlalawigan passed and approved Ordinance No. 09-2012 entitled “An Ordinance governing/authorizing the proposed borrowing of the Province of Sorsogon with the Land Bank of the Philippines (LBP) in the amount of TWO HUNDRED FIFTY MILLION PESOS (P250,000,000.00) to fund various priority infrastructure projects, farm to marker roads, buildings and other tourism facilities.” A photocopy of Ordinance No. 09-2012 is hereto attached as Annex “U”. The respondents Vice Governor and the concerned Sangguniang Panlalawigan Members, violated AGAIN a cardinal rule in the passage of Resolutions and Ordinance as provided for in the Article 7 of Implementing Rules and Regulations of the Local Government Code earlier cited. 18. On June 1, 2012, Provincial Treasurer Efilda C. Nogales and Provincial Accountant Mercedes J. Ativo duly noted by Governor Lee sent to the Complainant the Status Report of the Payment for Infrastructure Projects funded under the P350,000,000.00 loan of the Provincial Government of Sorsogon with Land Bank of the Philippines. Accordingly, as of May 31, 2012 the amount paid by the Provincial Government of Sorsogon thru Provincial Treasurer Nogales and Provincial Accountant Ativo is SEVENTY TWO MILLION NINE HUNDRED TWENTY FIVE THOUSAND NINE HUNDRED FORTY EIGHT PESOS AND SIXTY ONE CENTAVOS (P72,925,948.61). Herewith is the photocopies of the June 1, 2012 Letter attached as Annex “V” and List of Projects Funded out of the P350 M Land Bank Loan as ANNEX “W”. The release of the P72,925,948.61 is the result of the railroading of the P350,000,000.00 LBP loan, the Respondents have RAPED the funds of the Provincial Government of its money. 19. Worst, against the fundamental principle of public consultation, the loan was secured without such consultation with the members of the Provincial Development Council which fundamentally appropriates funds for the expenditures contained in the 20% Development Fund, and which is required under Sections 106 to 115 of the Local Government Code of the Philippines. (v) the life span of the project – the project may have already lost it serviceability but the loan is still unpaid. However, these queries remained unanswered. These are all contained in Complaint’s numerous privilege speeches which center on the anomalous in the manner most Provincial loans were hastily and conveniently facilitated by the Respondents with any regard for laid down laws, principles and procedures. Copies of the letters are hereto attached as Annex-9. 21. In concluding, the loan was obtained using the Internal Revenue Allotment as collateral and which required the: (i) public bidding as provided under Section 10 of the Revised Implementing Rules and Regulations of Republic Act No. (RA) 9184; (ii) approval of the Provincial Development Council (the body tasked to appropriate expenditures under the 20% Development Fund); (iii) without public consultation; (iv) securing the concessional rate of interest; (v) without first securing certifications from various agencies of the national government if the projects listed can be funded by the concerned agencies. THUS, THE HEREIN QUESTIONED TWO (2) LBP LOAN AGREEMENTS ARE ILLEGAL, GROSSLY DETRIMENTAL AND DISADVANTAGEOUS TO THE PROVINCIAL GOVERNMENT OF SORSOGON. 1. The said LBP Loan Agreements (Term Loan 13 in the amount of P100,000,000.00) and Loan Agreement (OTLF 2 in the amount of P250,000,000.00) with Land Bank of the Philippines be declared illegal, therefore NULL and VOID. 2. The unreleased amount of the LBP Loan should be immediately held in abeyance and the released portion (as of May 31, 2012) in the amount of SEVENTY TWO MILLION NINE HUNDRED TWENTY FIVE THOUSAND NINE HUNDRED FORTY EIGHT PESOS AND SIXTY ONE CENTAVOS (P72,925,948.61) should be returned to the creditor bank. 3. The above-named respondents be charged criminally for violation of RA No. 3019 or the Anti Graft and Corrupt Practices Law particularly Section 3 (a) and (g). 6. Other reliefs and remedies as may be deemed just and equitable under the circumstances are likewise prayed. IN WITNESS WHEREOF, I have hereunto affixed my signature this 10th day of July 2012 at Quezon City, Philippines. SUBSCRIBED AND SWORN to before me this 9th day of July 2012 at Quezon City, Philippines. Affiant exhibited to me his Driver’s License bearing number 3-90-102197 containing his picture and signature as competent evidence of his person. 6. If I should thereafter learn that a similar action or proceeding has been filed or is pending before the Supreme Court, the Court of Appeals, or any other tribunal or agency, I undertake to report that fact within five (5) days there from to this Honorable Ombudsman. SUBSCRIBED AND SWORN to before me this 10th day of July 2012 at Quezon City affiant exhibiting to me his Driver’s License bearing number 3-90-102197 to expire on May 11, 2014 containing his picture and signature as competent evidence of his person. Please register my opposition in the strongest terms against the Memorandum of Agreement (MOA) between Sorsogon Gov. Raul R. Lee and Land Bank of the Philippines (Legazpi Branch) relative to the P350.0 M Loan which was signed today October 19, 2011, witnessed by majority members of the Sangguniang Panlalawigan. This MOA is scheduled to be ratified, confirmed and approved in a resolution form by the Sangguniang Panlalawigan on Friday, October 21, 2011. An irregularity can be easily traced on the sequence of events prior to signing of the aforesaid MOA. On October 5, 2011, Gov. Raul Lee wrote a letter to the Sangguniang Panlalawigan Members enjoining specially its Presiding Officer, the Chairs and Members of the Committee on Budget and Appropriations and the Committee on Public Works, Infrastructure and Highways to be present in the signing of the MOA relative to the Loan of the Provincial Government of Sorsogon with the Land Bank of the Philippines. That signing will be held on October 19, 2011, 9:00 am at the LBP Legazpi City Office. Now, why did Gov. Raul Lee dated his letter to Sangguniang Panlalawigan on October 5, 2011? Obviously, the approval of this controversial loan was pre-arranged by Gov. Raul Lee with the officials of the LBP Legazpi City Office as cohorts. Please note that the letter of Mr. Hil Benedict G. Manzanadez, Dept. Manager and Head LBP Legazpi City Office is dated October 17, 2011 when he notified Gov. Raul R. Lee about the LBP approval of the P350.00 M loan. This letter was received by the Office of the Governor only yesterday, October 18, 2011. 1. The people of Sorsogon will remember October 19, 2011 as a black day our poor province will be sunk deeper to the oblivion by the gargantuan P350.0 million loan by Gov. Raul R. Lee. Many believe that our province will never move forward in the proper direction, ACCOUNTABILITY and TRANSPARENCY to the Filipino people is not upheld by most of our provincial officials. Without this basic tenet of good governance, the culture of impunity and shameless corruption will continue to pervade throughout our provincial government, leading to more poverty for our poor people. 2. Up to now, the Sangguniang Panlalawigan including the undersigned has not yet received any copy of the auditing and accounting report on the previous P260.0 M LBP Loan obtained by former Gov. Sally A. Lee. We, the present SP Members and the public as well, have the right to know the status or what the hell happened to the previous Administration’s loan, to determine whether or not said loan was really needed and was properly utilized or spent for the very purpose for which it was applied for. 3. The pending election protest against Gov. Lee docketed as Comelec Case No. SPA 09-187 (DC) entitled, Jose G. Solis versus Raul R. Lee filed last December 19, 2009 around 11:45 AM which is a Petition for Disqualification and Cancellation of Certificate of Candidacy. Case status – ACTIVE. 4. A civil case filed against Gov. Raul Lee led by Matnog Parish Priest Fr. Alexander Jerus, the Alyansa Laban sa Mina sa Matnog (ALMMA), Bayan Sorsogon and private individuals residing in the Municipality of Matnog opposed the iron ore mining operation in Barangay Bolacawe, in Matnog town for total violation of R.A. 7076 otherwise known as the People’s Small Scale Mining Act, R.A. 7942, the Philippine Mining Act, R.A. 7160, Local Government Code. Now pending before the Regional Trial Court in Sorsogon City. 5. A Graft and Corrupt Practices case against Gov. Raul Lee is now pending before the Sandiganbayan involving the alleged anomalous implementation eight years ago of the province’s Distance Learning Center Program (DLCP) involving P22 million pesos in funds sourced thru LBP and PNB loans. 6. And the most popular of all is the graft case of Gov. Raul Lee’s alleged direct involvement in the controversial P728.00 M fertilizer fund scam. Both graft charges have been elevated to the Sandiganbayan by the Ombudsman. 7. The LBP Notice of Loan Approval states that it is a violation under its General Terms and Conditions, Item No. 1 which provides that the LBP reserves the right to withhold loan releases should there be a case filed against the LGU or its officials involving the project to be financed. But Governor Lee is the top Sorsogon official who signed this MOA and who will also administer and handle all fund releases of all projects under this P350.0 M loan. We all know that Mr. Lee is already saddled by several criminal, anti-graft and corrupt practices cases pending before the Sandiganbayan and other courts. What kind of evaluation was conducted by LBP and the Sangguniang Panlalawigan? Where is logic here? Hindi ba ito ang nauuso sa buong mundo na corporate greed. O ang tinatawag na bureaucratic capitalism? Instead of condemning and sanctioning the questionable actions of the provincial governor, will it not appear that the Sangguniang Panlalawigan and Land Bank of the Philippines (Legazpi Office) have conveniently colluded with each other in tolerating the wrongdoings of Gov. Raul Lee by granting this mind boggling P350.0 million loan which shall be paid by the people’s money? This P350.0 M loan is the biggest loan in the history of Sorsogon. The justification and the necessity of this loan is practically nil. If no one from my distinguished colleagues in the Sangguniang Panlalawigan do not see anything wrong about this huge P350.0 M LBP loan and other previous loans, something must be very wrong somewhere. Shall LBP and SP allow themselves to be like the three monkeys? SEE NO EVIL, TALK NO EVIL AND HEAR NO EVIL. In sum, ratifying this Memorandum of Agreement by a majority vote of the Sangguniang Panlalawigan Members, such measure will only further inflame the peoples distrust to the Sorsogon provincial officials. Sangguniang Panlalawigan will appear endorsing the people’s hard-earned money to a governor beseted by several anti-graft and corrupt practices cases and whose integrity is already in serious doubt. God bless us. Thank you. After almost nine months the Sorsogon loan is still in purgatory. The continued delay in the release of the controversial P350.0 million loan with Land Bank of the Philippine is giving the Lee administration a big headache. This is due to the strong and determined opposition of the lone fiscalizer in the Sangguniang Panlalawigan by the grandson of late 8-term Gov. Juan Frivaldo. The determined stand of neophyte Board Member Vladimir Ramon Frivldo regarding the gargantuan loan application was due mainly on the propriety and morality issue hounding Gov. Raul Lee and his wife Sally. “ Are the poor people of Sorsogon still willing to trust the P350.0 million to a governor who is charged by 2 graft cases by the Ombudsman?” Frivaldo told to the organizers of the Bulusan Kontra sa Geothermal. Last April 14, 2011, the Philippine Daily Inquirer and other national newspapers published and announced that Sorsogon Gov. Raul Lee was charged with graft by Office of the Ombudsman and filed with the Sandiganbayan for his direct involvement in the very controversial P728.0 million fertilizer fund scam. After a month, the Office of the Ombudsman has approved the filing of second graft charges against Gov. Raul Lee and eight others in connection with the alleged anomalous implementation eight years ago of the province’s Distance Learning Center Program (DLCP) that involved a total amount of P22 million pesos in funds sourced thru LBP and PNB loans. The May 23, 2011 Resolution of Acting Ombudsman Orlando Casimiro paved the way for the filing with the Sandiganbayan of the charges that was made to wait for more than five years after the original complaint was filed with the Ombudsman in 2006 by SPM Rebecca Aquino. Frivaldo has been pleading and begging the governor to submit to the people of any report, findings, financial report/status whatsoever of the P260.0 million loan of former Gov. Sally Lee but he fell on deaf ears. He is also urging the poor taxpayer to ask also their governor to inform them what and how the said loan was ever realized- and much more-, used and spent. “Lastly, I have learned that Gov. Raul R. Lee and his cohorts will continue to harass me and concentrating their efforts to expel me from office because I am a vocal fiscalizer of his administration. Even I am the lone opposition in this chamber, I will stand my ground against bullies of Sorsogon. I will continue the legacy of our old man Tata Owan fighting for the right and for the sake of our poor constituents. Dahil sa mga kasaradayan kamo talaga ang tunay na lakas ng familia Frivaldo. Hindi naming kayo malilimutan” Frivaldo or Blady to his relatives and friends in his parting words. 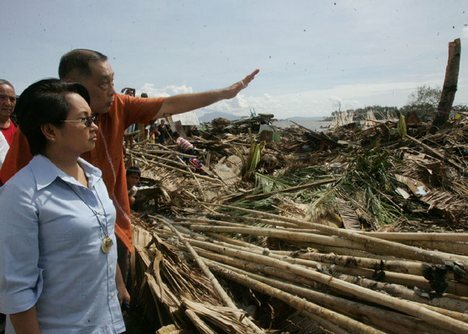 Raul Lee proudly showing to his dear mentor Gloria Arroyo the havoc they have caused to the people of Sorsogon. Raul Lee (left) with his beloved mentor, protector and supplier of liquid fertilizers.